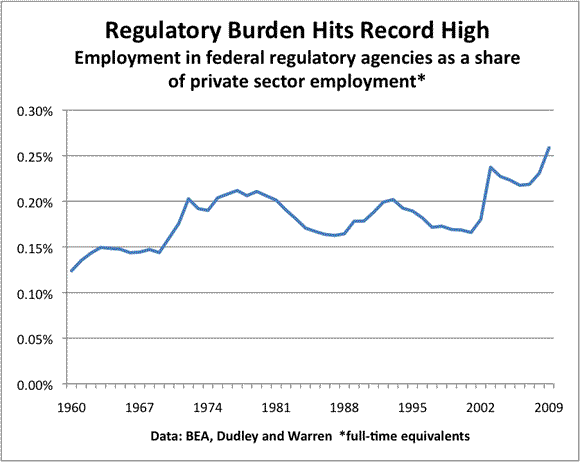 You can see in the graph below that this regulatory burden indicator stayed within a fairly narrow range between the mid-1960s and 2000. In particular, it fell through most of the Clinton years. But in the aftermath of 9/11, all of a sudden there was a surge in federal regulatory employment to historic levels, relative to the size of the private sector. Most of that jump was from an increase in security-related regulation–Homeland Security, TSA, and similar. As anyone who flies knows, the increase in security has done exactly what regulation usually does–slows down business and increases costs in exchange for some non-economic goal. In this case, the non-economic goal was straightforward and successful–stopping another terrorist attack on American soil. My guess is that most Americans still think that the increase in security-related regulation was worthwhile. Hell, I like knowing that there’s not a bomb on my plane. But I think that we have to acknowledge the possibility that the weakness in U.S. economy over the past decade, and especially the innovation shortfall, was related to the growth in regulatory burden. And it maybe that under these circumstances, countercyclical regulatory policy is precisely the right way to kickstart the economy. One final note: The growth in federal regulatory jobs is driven, in large part, by TSA and Homeland Security. But these agencies are not the only part of the federal regulatory sector that has grown faster than the private sector, as it turns out. 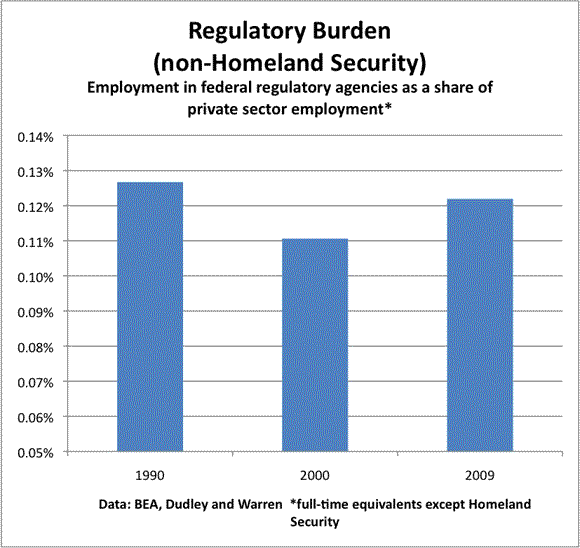 The chart below shows the ratio of non-Homeland Security federal regulatory employees to private sector employment rose from 2000 to the recession year 2009. Over that stretch, FTE employment fell in the private sector. Meanwhile, notable regulatory agencies such as the SEC and the FTC gained workers. In my view, these numbers make th case for countercyclical regulatory policy more compelling. * For the federal regulatory employment figures, I used the appendix data from “A Decade of Growth in the Regulators’ Budget:Years 2010 and 2011” by Susan Dudley and Melinda Warren. I also did spot checksof several departments to make sure that the published figures agreed relatively well with the Dudley/Warren data (which they did).